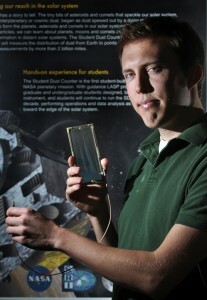 CU/LASP physics graduate student Andrew Poppe operates SDC and analyzes the data. 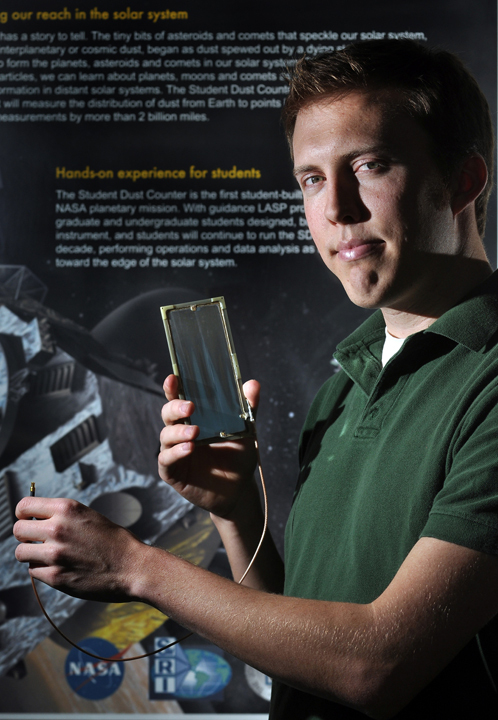 The Venetia Burney Student Dust Counter (SDC), a CU/LASP-built instrument aboard the NASA New Horizons mission to Pluto, just became the record-holder for the most distant functioning space dust detector ever in space. On October 10, the SDC surpassed the previous record when it flew beyond 18 astronomical units—one unit is the distance between the sun and the Earth—or 1.67 billion miles, which is approaching the orbit of Uranus. The only other dedicated dust instruments to measure space dust beyond the orbit of Jupiter were aboard Pioneers 10 and 11 in the 1970s. Additionally, SDC is the first science instrument on a planetary mission to be designed, tested, and operated by students. Poppe is one of five students on the current SDC team, and one of 32 who have worked on the instrument since the project began in 2002. The original team of approximately 20 undergraduate and graduate students has evolved over time, with new students brought into the fold as the nearly 20-year New Horizons mission has proceeded from concept development through launch and into its ongoing flight phase. LASP manages the SDC instrument project and has a long tradition of involvement with student instruments, including the Solar Mesosphere Explorer and the Student Nitric Oxide Experiment. LASP recruits both undergraduates and graduates from CU to help with instrument design, construction, maintenance, programming, and operations. Funding for the SDC came primarily from the NASA New Horizons mission, through the Johns Hopkins University Applied Physics Laboratory, which manages New Horizons; and the Southwest Research Institute, home institution of Stern and the center of New Horizons instrument observation planning. LASP has also contributed funds to help pay students working on the SDC. In June 2006, the instrument was renamed for Venetia Burney, the English schoolgirl who, at age 11, offered the name “Pluto” for the newly discovered ninth planet in 1930.